The last month has been very busy with two motorsport events back-to-back. Have a couple of weeks off before the next event, so thought it would be a good time to look back and post some stories on my Le Mans adventure. Hope you like the photos from the “spectator” side of the fence. We left Boston late Monday night (June 9), and arrived in Paris on Tuesday morning (June 10). On the Air France flight over, we found out there would be a national train strike on Wednesday (and probably on and off for the next week). Hence, Laura stayed in Paris, since she planned to be there to spend time with her sister visiting from London, and would meet up with me later in the week for the race. So I took the TGV from Charles de Gaulle airport to Le Mans, then the TER to La Ferte Bernard. After arriving at La Ferte Bernard, I walked from the train station for a couple of miles to the Campanile Hotel. By now was really tired, and was happy to get to the hotel for some rest. We stayed at this hotel a couple of years ago for Le Mans, and really enjoyed it. This time the hotel was part of a tour package with Select Motor Racing (https://www.selectmotorracing.com), which included bus transfers to and from the track for the Friday pit walk and drivers parade, and the race on Saturday and Sunday. The tour also included access to a bus overnight on Saturday night for some rest. For the race tickets, we ordered these on our own, since we could order them last year with our ACO membership. The ACO membership (http://www.lemans.org/en/aco-department/club_3_2_1812.html) is really worth it since it gives you priority booking of the race tickets and access to the ACO members areas at the track near the Dunlop Bridge, Stand 18, and the Raccordement (outside the “S” Ford Curves). Having access to these ACO areas makes a big difference, since they are strategically placed at different locations along the track and provide a place to get food, rest, and shelter from inclimate weather. For the stands, we got tickets for the Dunlop stand (so I could photograph the Dunlop Courbes over the fence) and Stand 34 (selected seats at the very end and front row, so could get shots of the Audi pits and front straight). On Wednesday (June 11), was thinking how I could get to Le Mans, since would normally have taken the TER, but due to the train strike wasn’t able to do this. Found out there was a Hertz rental car location about a mile from the hotel on highway D323, so decided to rent a car so I could get to Le Mans for the afternoon/evening practice and qualifying sessions. It took about an hour to drive to Le Mans via D323 south. Upon arriving at Le Mans picked up a pass so I could park in Lot 9, since this was close to the front straight and was on my way back from Porsche Curves. 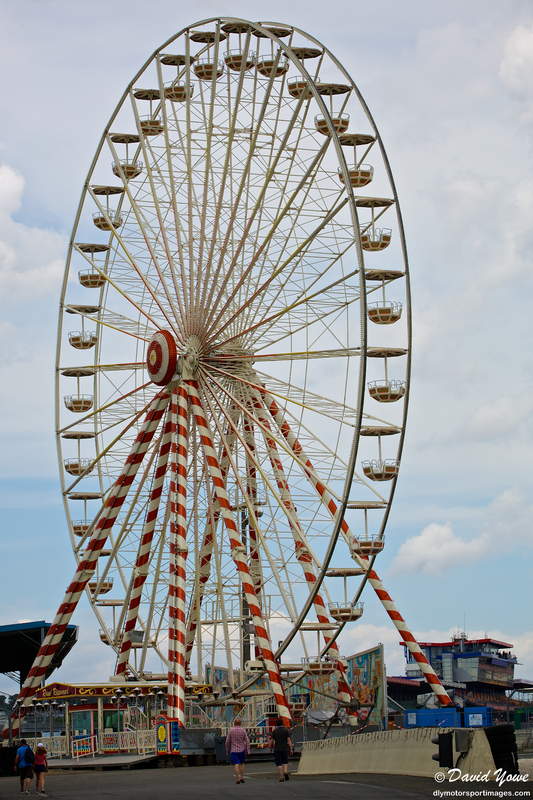 Saw the “iconic” Ferris Wheel as I walked from the car park to the race track (Canon 5D Mark III, Canon 70-200mm f/2.8L IS II, 95mm, f/8, 1/1250, ISO 100). Before getting to photos from the track, just wanted to show you some maps to get your bearings, and to give you an idea of the size of the track. Please refer to my post from our visit to Le Mans in 2012 for additional maps of the area and race track (https://dlymotorsportimages.com/2012/06/13/2012-le-mans-24-hours-june-16-to-17) and a website called Aysedasi’s Le Mans (http://www.aysedasi.co.uk/2002/maps.htm) for another perspective on the vantage points at this track. Also, Le Mans is an “endurance race” not only for the race teams and drivers, but for photographers as well. This is because everything about Le Mans is larger than usual including the track size (about 8.5 mile long), number of teams and cars competing (55 cars this year), number of spectators (263,300 spectators this year), and of course the length of the race. Even the length of the practice and qualifying sessions (total of 10 hours over two days) are longer than most car races are. Because of this, you need to carefully plan your daily photography strategy in terms of where to shoot, when to shoot, how long to shoot for; and pace yourself, since its very easy to get exhausted at this event. From a spectators point of view, the main vantage points for photography are at Tertre Rouge, the Esses, Dunlop Curve, front straight stands, “S” Ford Chicane, and Porsche Curves. Haven’t been down to Arnage and Indianapolis, but hear you need a step ladder to be able to shoot over the fence. When planning my photo shoots, I tried to break the track up into sectors, and focused on different sectors for different sessions, pending the suns direction, time of day, and the crowd of spectators expected to be there. Within reason, I tried to be at locations when I thought there will be the fewest spectators at the vantage point. Although, this is difficult to do in practice, when you consider about 260,000 people attended this year’s Le Mans. Also, remember to give yourself plenty of time to get to different parts of the track, especially on the race days, since the large number of spectators makes it difficult to get from A to B quickly. The best days to photograph are on the Wednesday and Thursday practice/qualifying sessions; since you have access to all the grandstands without a ticket, and the other spectator viewing areas are relatively uncrowded. Another good time to photograph is early Sunday morning. Anyway, now on to the photos. Entered the race track near Maison Blanche, and couldn’t resist but get another shot of the Ferris Wheel (Canon 5D Mark III, Canon 70-200mm f/2.8L IS II, 102mm, f/8,1/400, ISO 100). Walked along the outside of the track and up through the stands along the front straight. Here’s some shots up and down the front straight to give you an idea of what this part of the track looks like (Canon 5D Mark III, Canon 70-200mm f/2.8L IS II, 70mm, f/8,1/160 or 1/400, ISO 100).